From the first step I took onto Shelter Island I was mostly alone. Despite this, I was able to fund my training and become a Grandmaster Scribe without ever losing focus (I played this character exclusively for the first week or so after launch). 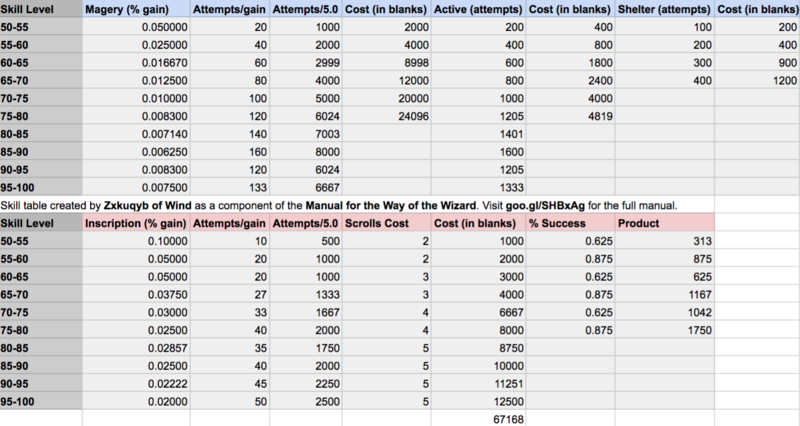 The skills I chose to seek training in were specifically selected to maximize the damage of my spells (+150% spell damage), and minimize cost (spell scroll return), while also building skill in two highly costly skills: Inscription and Magery. Additionally, I wanted my training to be a challenging, rewarding, and enjoyable experience. 1. Spell scrolls can be created without using reagents or mana. 2. Using spell scrolls to cast a spell gives the same chance to increase Magery skill as casting using reagents does. 3. Inscription increases spell damage, and provides a chance for spell scrolls to be returned on use. 4. There are several skills that can increase spell damage output without increasing cost. In this manual, I'll describe in detail the path I took to become one of the most productive scribes in all of Avadon. This document will also serve as an invitation to anyone who would like to follow a similar path to becoming a powerful mage and scribe. Keep in mind that this is an advanced path, not for the faint of heart, or the simpleminded. You will be extremely vulnerable to assaults of any kind from other people or creatures. If you follow the instructions laid out in this manual I cannot guarantee that you will become a true wizard. Wizardry is an art, and not a science. There is much more to being a wizard that has not been included in this manual. However, this is a start. 1. Fun and engaging: cast spells and take down creatures quickly while managing resources and practicing skillful movement. 3. Maximizing return: find creatures with areas of relative weakness that match your areas of relative strength. 4. Strategy and tactics: isolate individual creatures, and avoid any situation that allows creatures to damage you. Choose a name. This is important. People ought to know what to expect from you. Next, you'll run to the mage NPC and train to Apprentice Magery and Eval Int using your personalized training credits that you received in your backpack when you landed on the island. After you've done this, you'll run to the butcher one screen East of the docks and use the remaining training credits to increase your skill in Forensic Eval. Run in the main entrance to the dungeon, just North of the healer shop. As soon as you enter, use all three of your intelligence stat stones (to benefit from 10x Meditation gains). Start a campfire as centrally located in the main room as possible, and start wrestling mongbats. Heal yourself using your starting bandages. As soon as you've gathered 25g run back to the butcher and buy a skinning knife. Return to the dungeon until you have at least Apprentice level Wrestling and are at least a Novice in Healing. Should be something like 10 minutes. 1. Use Forensic Eval on yourself (for smart gathering) constantly, now that you have a skinning knife and are surrounded by corpses. 2. Stay near a burning campfire as often as possible to continue training your skill in Camping. 3. Keep your "Begin Hunt" active by using Tracking if you die or log out, and track "Aggressive Creatures" whenever idle. 4. Use Spirit Speak on yourself until you have filled your spirit stone. You can stay in this area and wrestle to get your damage bonus skills up quickly at little to no cost, but you don't have to. You're a viable solo adventurer at this point, and are ready to leave the island. Use the moongate to leave Shelter Island. The closest and easiest spot to find creatures is one screen Northeast of the Andaria moongate. You want to fight creatures that have as little Magic Resist as possible to maximize your spell damage. There are ruins of an old stone structure there, haunted by ghostly footmen and knights. These creatures each take somewhere between 6 and 10 Lightning spells to take down, depending on your skills, whether you get charged spells, and basic damage variation. Do not let the melee ghosts within arms reach of you at any point, and try to keep the archers out of range (10 tiles or so). This will be good practice for later on, when you have forgotten everything you learned about Wrestling. Continue to gather kindling using your dagger, and keep your spirit stone charged by using Spirit Speak until you gather energy from every available corpse. Once you have used all the charges on the spellstone you received on Shelter Island, you should have gathered something like 1200g and 300 leather. You can sell the leather to other people for about 3g ea (use the Discord community: #buy-sell-trade channel), or you can transfer the leather to another with Tailoring and craft them into blank scrolls. Return to the ghostly ruins, or another spot of your choosing, and continue gathering gold and hides from the ghostly creatures. If you become a Journeyman Mage before you reach that level of skill in Inscription, just continue making lightning scrolls and fighting creatures with them so you can build up extra gold for yourself to fund later training. By the time you are a Journeyman Scribe, you should have 5k or so gold. With 2k, buy a full spellbook with circles 1-6 from a vendor house. (My vendor shop is located two screens West of the Andaria moongate. Blue robe and wizard's hat, named "Spell Scrolls by Zxk".) With the rest of your gold, buy as many blank scrolls as you can, and begin making Mind Blast spell scrolls. Now that you are casting Mind Blast, and have a bit of a slush fund, you can afford to return to the dungeon on Shelter Island and knock out drakes and carrion beetles. Both of these monsters are extremely vulnerable to the Mind Blast spell, and give a pretty solid loot return (even at the reduced loot rates in the dungeon on Shelter Island). Drakes die from 4-5 Mind Blasts, and drop about 100g. You can find them by entering through the mine underneath the town moongate, and running east from the stairway entrance. If you want to gain Magery and other skills quickly, go here. I recommend this, because I found that I had more than enough gold to fund Mind Blast spell scroll creation that outpaced my gains in Magery pretty quickly. In fact, I ended up having a ton of excess Mind Blast scrolls (~2000) that I didn't even use to gain Magery because I was already an Expert Mage by then. If you want to build up a more solid bank, then you can head to the antlions that are found in the Rolling Hills near Andaria, just a few screens Northeast of the ghostly ruins. Antlions have extremely high armor, and low magic resist, making them another excellent target for you at this phase of your training. Switch to creating and casting Energy Bolt scrolls once you become an Expert in Magery and Inscription. Continue slaying evil creatures for profit and fame. Keep in mind that if you have an excess of funds, the most rapid method for gaining skill as a Mage is to cast the most difficult spell you can (e.g., Flame Strike). The reason for this is that you will fail more often when casting more difficult spells, and won't have to wait to regenerate mana before you can make another attempt. Once you become an Adept Mage and Scribe you'll no longer be able to create scrolls that will train your Inscription and also train Magery directly. At this point you can decide for yourself what your next steps are. I chose to drop Healing to Apprentice level, and then began dropping Spirit Speak next. I found that it was extremely helpful to have the ability to start a bandage that had no mana cost, didn't interrupt my offensive spellcasting, and would give me the equivalent of a Greater Heal in health. You are now a well-trained and dangerous mage and scribe that has the power to take down almost any creature you may come across. With exciting and engaging adventures ahead of you, your battles will also be highly profitable. Go on the hunt for ways to change the hues of your spells so they are unique, or pick up some Society Jobs and become an Artificer! Seek out and research the history of Avadon by gathering research notes! Join or create a guild with others who will appreciate your contributions! There are a multitude of options for you in the Outlands. Is there a way to pronounce your name? Or is it like Cthullu, impossible to speak in our tongue? Popping in to say I used this guide to create my first character on here, and have played him exclusively with the exception of a tailor to make scrolls. Been able to get a blessed runebook and a house so far, so thank you for making this as I cant stand melee for some reason. I believe I've decided on going with these skills as a final build Magery, Meditation, Evaluating Intelligence, Spirit Speak, Forensic Evaluation, Tracking, and Camping. Inscription was nice but for my purposes I believe camping will suit me better.